DAM High Access supply and operate our own MEWP'S (motorised elevating work platforms) which are more commonly known as Cherry Pickers. We offer full day or half day hire so we can meet your high access needs. So if you wish to carry out the work yourself then DAM can supply the relevant MEWP accompanied by one of our fully licensed operators to get you there. If necessary, our operator will also assist with work if required. 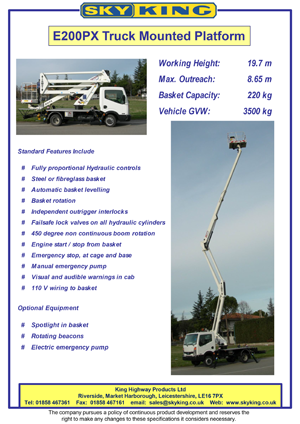 The truck mount cherry pickers that we have available at DAM High Access are much lighter and narrower than equivalent working height self propelled platforms. This means that they can be used on a wider range of applications, especially where overall weight is crucial and access restricted. If you have internal high access requirements, then we can supply an electric powered machine which will fit through a standard commercial double door. Contact us on 01843 831555 or any of the numbers shown above for a FREE site survey, advice and quote.